Tonight Goods On Lacrosse returns on the Lacrosse Radio Network with a whole new revamped look, featuring a brand new logo. After a short hiatus from the network the show will be returning to its regular time slot of 6:00 eastern every Wednesday evening. 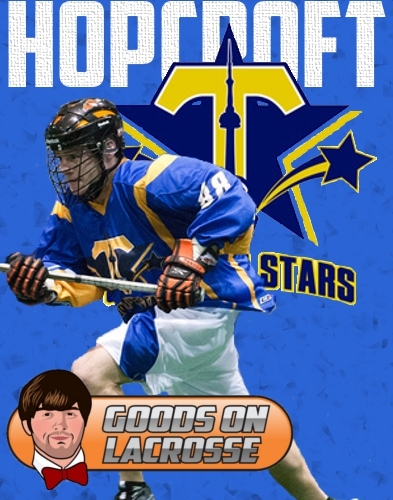 The first show back will feature Toronto Shooting Stars forward and Buffalo Bandits practice squad member Derek Hopcroft. Hopcroft has been playing in the Canadian Lacrosse Season this Winter for the Shooting Stars. In seven games this season he has scored twelve goals and fourteen assists, which has him at second on the team in scoring. Before coming to CLax, Hopcroft spent two seasons in the NLL with the Colorado Mammoth. His best year came in 2011, when he scored fifteen goals and eleven assists in eleven games. This off-season he was acquired by the Bandits in exchange for a conditional sixth round pick in next year’s draft. We’ll discuss Derek’s experience playing in CLax, his time with the Shooting Stars, and his future in the NLL. Questions for Derek can be directed to my Twitter, @GoodsOnSabres. The Toronto Shooting Stars are currently tied for first place with an 8-6 record with six games remaining on their regular season schedule. The Shooting Stars, playing in their first season in Toronto, call the historic Maple Leaf Gardens their home. In the past, Goods On Lacrosse has featured guests such as Lewis Ratcliff, Kevin Crowley, Jim Jennings, Chazz Woodson, Jeremy Thompson, Tim Fallon, Steve Panarelli, and Greg Bice. The Lacrosse Radio Network hosts some of the best lacrosse coverage you can find, with shows featuring everything from professional to high school lacrosse. You can find the show at 6:00 tonight by clicking here to listen on the Lacrosse Radio Network.